While it is often advisable to be cautious in life and takes things at a steady pace, there are times when one realizes that they are in a situation which they may never find themselves again, and they simply need to go for it. Perhaps in a job interview or if one was to meet a celebrity in public. (I was going to add "a first date" to that list, but I realized that could come across very wrong.) In a similar sense, some movies take their time in setting up a certain, deliberate pace and allowing the story to slowly unfold. While others, dispense with any of that junk and simply bring on the action as quickly as possible. This is how Bloody Birthday operates, and it's just one notable aspect of this quirky movie. As Bloody Birthday opens, we get an odd voice montage letting us know that three babies are being born, as we watch time-lapse photography of an eclipse. The story then jumps ahead ten years later, where we meet the three kids -- Debbie (Elizabeth Hoy), Curtis (Billy Jacoby), and Steven (Andy Freeman). These seem like normal, well-adjusted kids...except that they aren't. All three have no regard for others and enjoy killing people. Timmy (K.C. Martel) is a classmate of the three and a nasty run-in with Curtis convinces him that something is wrong with these kids. As the body-count rises, and the police are convinced that there is a "psycho" on the loose, Timmy's older sister, Joyce (Lori Lethin) becomes involved and these siblings decides that they must stop the killer kids. I frequented many video stores in the 80s and I could always be found in the horror section. The number of black boxes on the shelves was often overwhelming and I couldn't rent them all. I clearly remember seeing Bloody Birthday in many store and can certainly recall the original cover art, which depicted bloody hands emerging from a birthday cake. Having now seen the movie all these years later, I wish that I had given it a chance, as this film is a hoot. As implied above, Bloody Birthday wastes no time in not only introducing its premise, but its villains as well. The second scene contains the sort of murder which we'd get in any slasher film of the day -- the kind in which the killer is not revealed. But, just moments later, we are introduced to Debbie, Curtis, and Steven, and, in a scene which is somewhat shocking, we see Debbie confess to the earlier murder, as this ghastly trio kills that confidant. So, this clearly isn't going to be a "whodunit?" No, Bloody Birthday is one of those movies where the audience knows the truth and we squirm as we wait for everyone in the film to finally catch up. Of course, this contains some scenes where someone does learn what the kids are up to, but no one believes them. 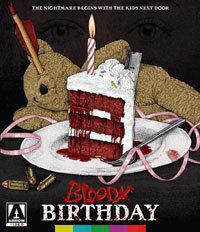 In the end, Bloody Birthday is a movie which simply plays by its own rules. It was clearly a low-budget affair, as the kids wear the same clothes over-and-over (leading me to wonder at first if all of the murders and funerals were taking place in the same day) and continuity errors abound. And yet, the movie's fast pace and no-nonsense approach to what should be a taboo subject is infectious. Yes, there are times when you are going to laugh at things which were never meant to be funny, but you will also marvel at this movie's quiet audaciousness. The movie gives the term "kids can be cruel" a new meaning, and it makes us look at all of the babysitter movies from the 80s in a new light. The Bloody Birthday Blu-ray Disc contains a handful of extra features. We begin with an AUDIO COMMENTARY from Writer/Director Ed Hunt. This is followed by a second COMMENTARY from The Hysteria Continues. "Bloody Babysitter" (8 minutes) is a modern-day interview with lead actress Lori Lethin who shares her memories of the film. "Bad Seeds and Body Counts" (20 minutes) has film journalist Chris Alexander talking about the "killer kid" sub-genre and how Bloody Birthday fits. (While starting with The Little Rascals, which is interesting.) "Starships and Killer Brains" (21 minutes) has Ken Gord talking about the work of Ed Hunt and how low-budget films worked in the 70s and 80s. Bloody Birthday Executive Producer Max Rosenberg appears in an interview (17 minutes) from some time in the past, as Rosenberg died in 2004. Here, he gives a frank overview of how Bloody Birthday got made. Finally, we get two TRAILERS for the film -- a THEATRICAL TRAILER and a shorter PROMO TRAILER.